“What questions do you have for us and so on”. Most people will already have some kind of image of themselves in their head and so they will have pre-determined answers to these basic questions focused on their idea of what will impress the interviewer the most. Of course, the interviewer is left with the answers that tell them something, very little about that person and in most cases these answers will be boring and very similar to each other. So the interviewer asks questions that reveal everything about a person – their quality of intellect, dedication, morals, experiences and most of all the energy. The art of interviewing thus revolves around getting through the barriers one has created for oneself. Asking questions that are empathetic, that make an interviewee want to share their story and answer with honesty can help getting them out of the cocoon, they would have created for themselves. There are two ways of conducting an interview. Either the interviewer could be tough and aggressive with the candidate or they could focus on getting the candidate to be at ease and be comfortable. Both these techniques are effective but latter has proved to get the candidate to open up more and answer questions with honesty. An interview should always start with questions about goals that a candidate has already accomplished. This makes the candidate more confident and makes them feel comfortable. The key to a good interview question is to make the candidate feel like he is there to tell their story and that the interviewer is present there to listen. While questions about a candidate’s childhood and early life might seem unrelated and ambiguous, these questions help give an idea about their background story and the struggles they might have faced and overcome. These questions give a great and true picture of the interviewee’s dedication to accomplish something and be successful. These personal questions put the interview to a great start and help the candidate be honest and open. Once, a person’s background is established, questions can be asked about how the past year has been for them. These questions lead the interviewee to talk about the goals that they have achieved. This helps them feel confident while answering questions. The candidate can thus talk about the vision that they might have for themselves, the goals that they would want to accomplish in the near future and how they reached the point of interviewing specifically. On understanding this, the interview is given a much better and clear idea on how well this particular candidate will fit into the company. Also, the level of motivation of the candidate will be understood before the job itself. The toughest of interviews are interviews with people that are modest. With such kind of people, it might be really hard to judge the kind of life they lead in private and public. To know a person completely in and out, one needs to get through personal barriers which the candidate might have created for them. Personally, every candidate sitting in front of the interviewer will have certain personal things which they cannot share with a stranger. But such a barrier can be crossed if the person is empathetic. Give them a counter of how one particular situation was for the candidate itself. Questions that open new doors to conversation are key to making the candidate keep talking. These questions will help figure out what the person could be at their best, their aspirations and why he fits into their company. Question like when were you most satisfied with your life or why do they think something is lacking for you will help push the candidate in a new direction. Finding out a person’s character in such a short span of time might be done by putting then in hypothetical and bizarre situations. Employers use behavioural interview questions to ask at an interview mainly to assess their past as well as the potential future performance. One basic thing that an interviewer will ask would be for providing an example, a particular skill that had been demonstrated by the candidate for the required position. The employer may also ask how they had handled a certain situation or an assignment in the past. They can be asked to describe a specific time when they had to try to function and work with a difficult client. Such behavioural questions are asked by interviewers to determine whether or not the person is fit enough for the position mentioned. Any past performances always stand firm in the present and provide a backup that even the future will be bright enough. While knowing any past accomplishments, the interviewer will further ask for a detailed and elaborated description regarding past professional experiences. This will help the interviewer in understanding whether or not the candidate qualifies for the job. Behavioural type interview questions are mainly used for providing an opportunity for the person to connect with others using the skills that they possess. These skills and knowledge is mainly put into the objectives of the job. So the individual should have all unique skills within them and all the required personal qualities so that they are the first preferable candidates for the job. These skills and different qualifications will keep improving their progress in the company. Assessment of all the knowledge that an individual has along with all the values, work ethics and skills they possess are asked in situation type questions. By asking such questions, the organisation does understand whether or not the respective candidate fits enough for the job being offered. Also, the entire ability of the person will be reviewed upon. When such questions are asked to candidates, one of the main reasons is for knowing all of their past performances. On the other hand, situation type questions mainly focus to evaluation as to how well the person can respond to a challenging situation which isn’t really happening at the moment. A situation will be presented to them. Once the situation has been entirely understood by them they will have to respond accordingly on it. A brief explanation may also be asked as to how quickly the situation will be solved. By giving them puzzles to solve, it shows the different character behaviours about that person. The way he solves the puzzle or how faster he solves the puzzle will show their behaviour pattern. This test has helped the interviewers to actually know the strength and skills about the candidate. For some candidate, they may show signs of stress and frustration and the candidates who are able minded will calmly solve the puzzle. Questions which speak about predicting about the future are always expected to have an exciting answer. Such a question asking that after a year still in the company what achievements the person has achieved is interesting enough. This question will reveal whether or not the candidate expects to be someone big later on in the future with the company. It also reveals the vision that the candidate has for the company. 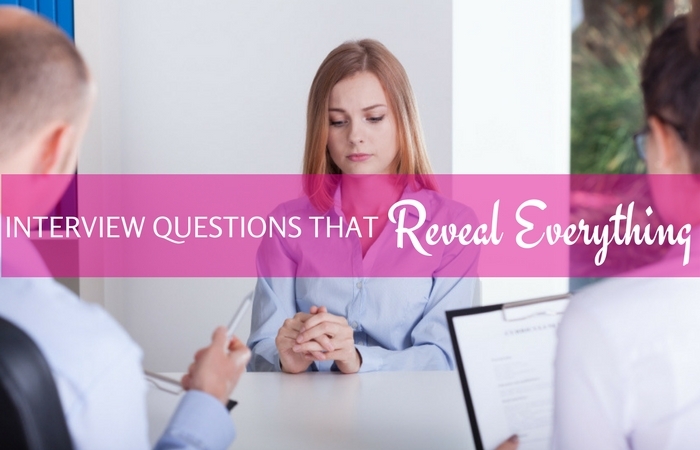 Other than the job description itself, unique interview questions also reveal certain personal things within the candidates. So far, asking the candidate when they have been most satisfied with life will help the interviewer to know the candidate in a much better way. If the candidate is willing to share, they will show where they have faced hardships in their life and how everything has turned out in a positive way. This will be the position where they have achieved maximum self-satisfaction about the life they are living. Hypothetically during the interview, the interviewer should ask a question to the candidate. They must mention what if the person got hired by the company, the candidate loves the job and they are paid the salary that they desire. Despite all these benefits, will they really consider a different job from a different company? The answer will reveal where the interests of the person really lies at. If the person is passionate about the job and the company, they will decide and opt to stay. If their interests lie elsewhere they can mention that. So, the interviewer will understand whether or not the person is fit for the job. A role model is one of the most important people in the life of the candidate. They are someone who has influenced the personal as well as professional lives of the candidate. So asking such a revealing question will help you know, how and in what way such an individual has had an influence on the life of the person. The interviewer will also realise whether the candidate has the same level of success and ambitious nature as their role model. This job may not be the first job of the candidate as they must have also worked and faced numerous job interviews in the past. This question will help the interviewer to get a better and a full picture regarding the entire work history of the candidate. If they have had many jobs in fewer years, it will reveal whether or not the candidate still has the same level of motivation or not at the moment. It also shows loyalty, if the person has had fewer jobs or stuck to one job it shows that they are loyal to the workplace. This question may also seem to be a very strange one but it has a very beautiful and effective explanation behind it. Every candidate knows that within themselves they have a unique quality or superpower which none of the people possess. They can use this quality to the best of their ability everyday in the workplace. The candidate will also understand that the interviewer is trying to get to know them in a much more personal way. They may also have a favourite animal which they would consider as their spirit animal. Asking someone what is their spirit animal is really good to know. By this way, they will reveal positive qualities which these animals possess. Qualities such as gracefulness of the swan, calmness of the duck, patience of an owl, etc. can be described by them. On hearing this, interviewer may also be surprised and understand the person much better as an individual. During an interview, the interviewer is looking for the perfect candidate who would fit the job profile entirely. They would go through a number of candidates present before finding the perfect person for the job. This person can only be found out faster if they both start building an effective relationship as soon as possible. By getting to know each other on a more personal basis can be very helpful. When the interviewer will ask certain interesting questions which reveal personal things about the candidate, they will realise properly what kind of a person the candidate is. Then they can promptly make a decision whether positive or negative for selecting the candidate for the job.